In Background to where we work. In Sweden a crayfish party is a traditional summertime eating and drinking celebration. In the 1960’s stocks of crayfish throughout Europe were affected by a crayfish plague. In the 1970’s signal crayfish were introduced from North America to the UK as a commercial initiative for export to the then lucrative Scandinavian market, however it was not appreciated at the time that the Signal Crayfish were carriers of the crayfish plague. 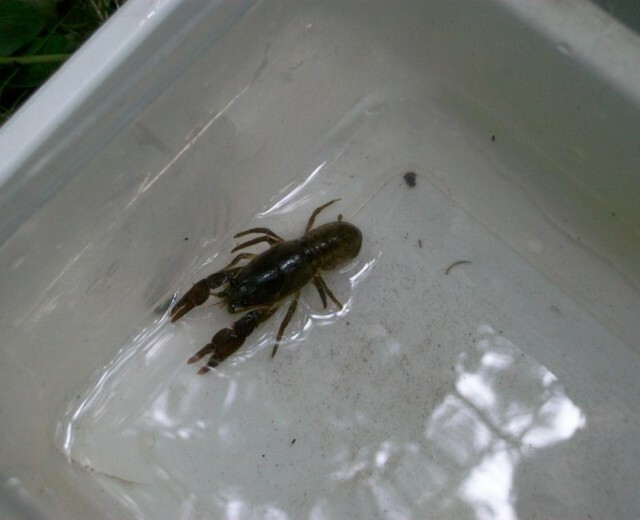 The crayfish plague and the highly competitive signal crayfish have now decimated our native white clawed crayfish population in the UK to the extent that they are now a protected and endangered species. 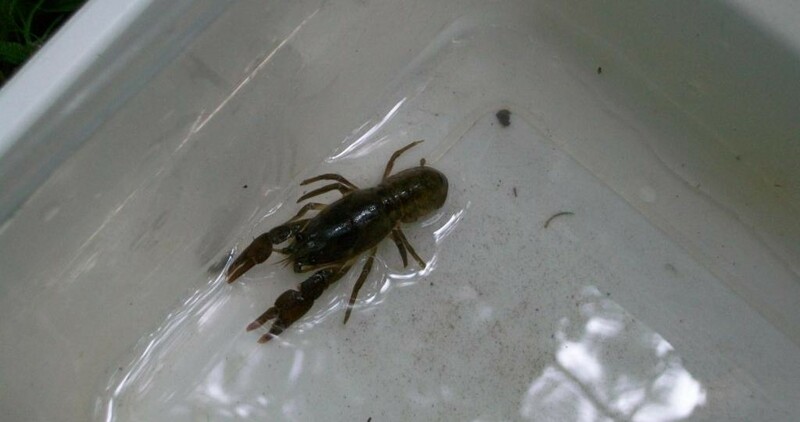 The Croft Rangers are working with other agencies to help protect the native white clawed crayfish population that inhabits the Fishpool Valley; this is also an essential element of the Fishpool Valley Restoration Project. 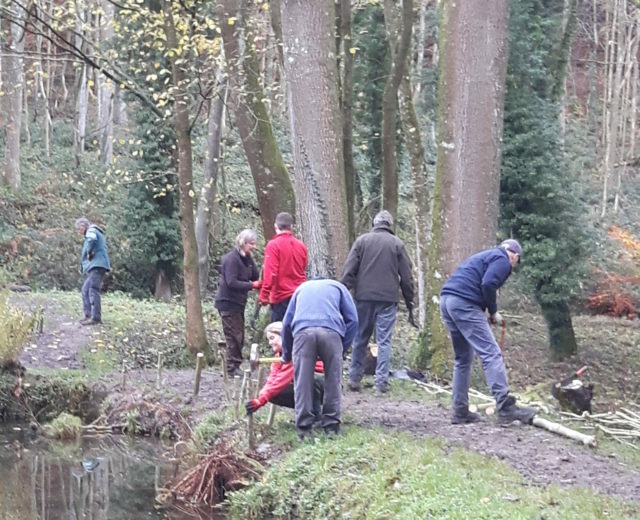 It was a case of everyone getting on with the job. Once cut, the wood is trimmed and cut to size. One of the problems we have in the Fishpool Valley is heavy deposits of silt on the bottom of the pools, this has built up over many decades and disturbance to the silt is detrimental to the crayfish. 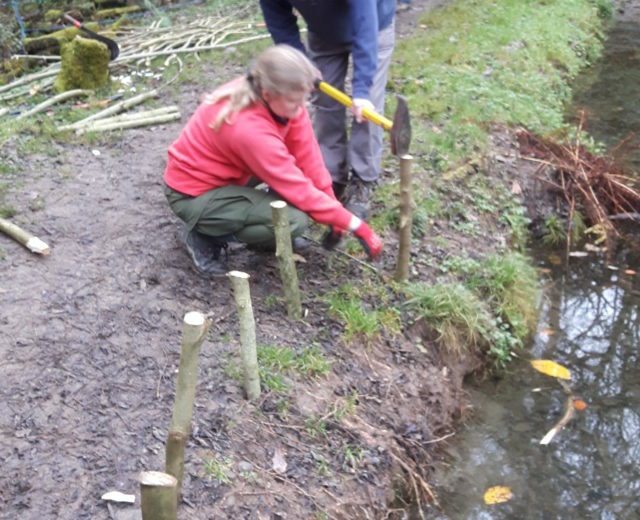 Another issue is that habitat for the nocturnal crayfish are the burrows they make in the side of the banks around the pool edges. Clear evidence of erosion here. 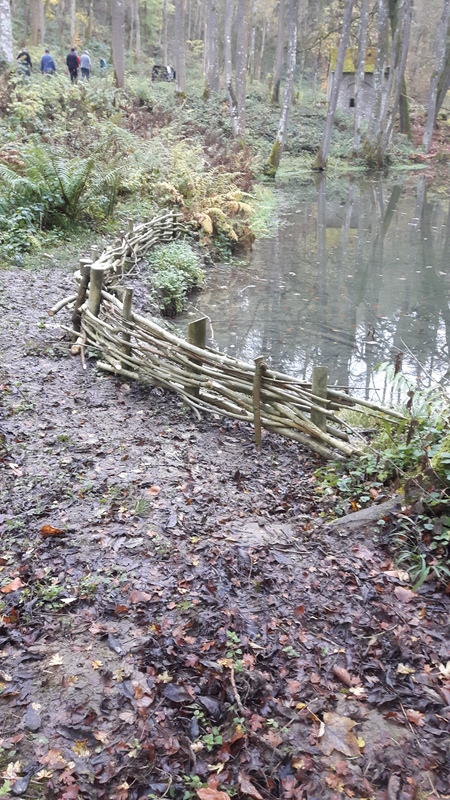 A simple and hopefully effective barrier that will help to reduce the erosion of the bank. 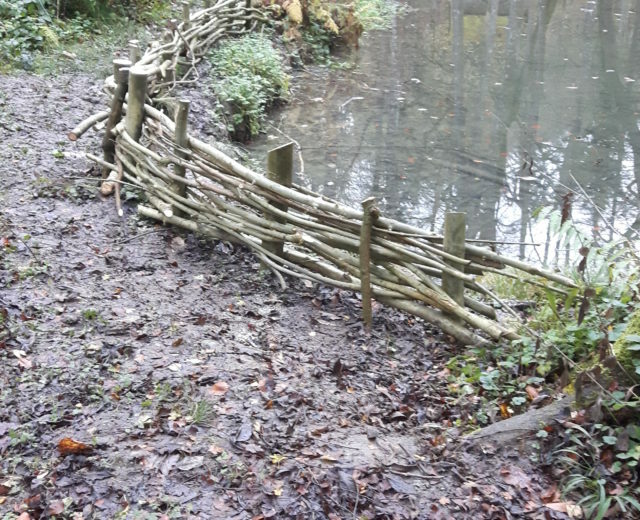 In order to try and discourage dogs from jumping into the pools and from adding to the erosion of the banks of the pools, we have been constructing hurdles at various locations where disturbance is most likely to occur. 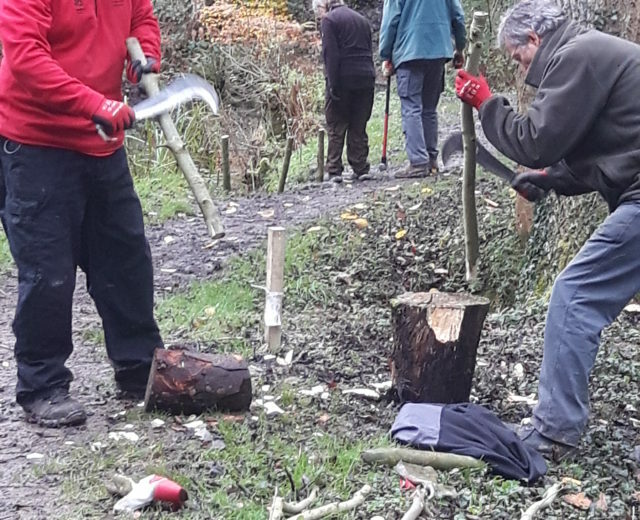 The wood for the hurdles is also a part of the tree thinning process, where we have been reducing the amount of tree regeneration; typically Ash & Sycamore saplings. 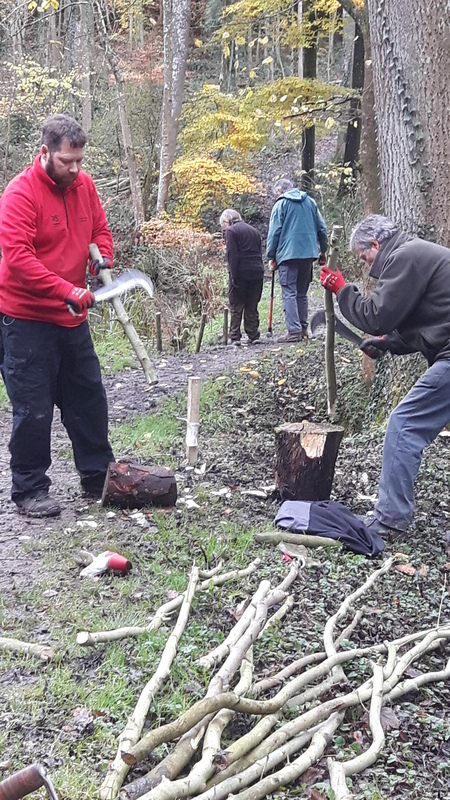 A single mornings work doing some thinning produced enough wood to enable us to construct several hurdles that have been placed on the sites that have deteriorated the most. White Clawed Crayfish are our only native species of crayfish; they are a protected species and are now classified as endangered. 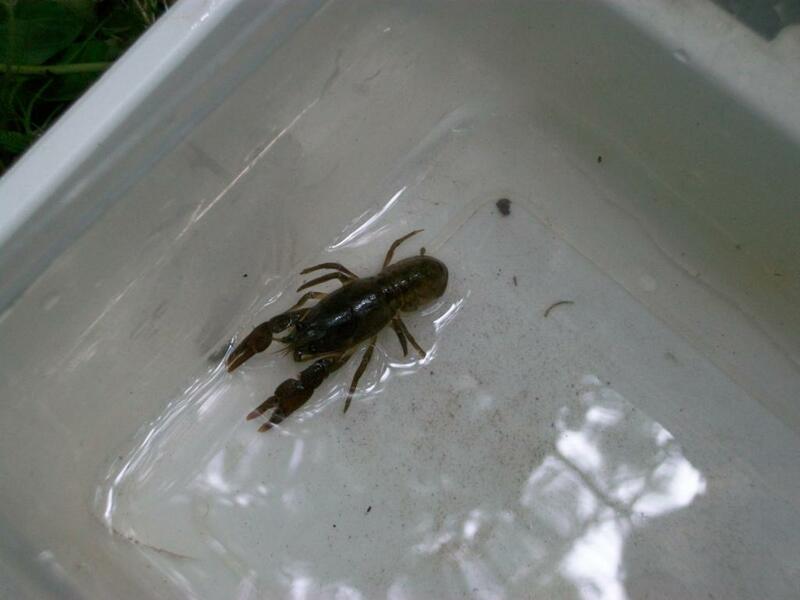 We have these native crayfish living in the streams and pools of the Fishpool Valley here at Croft. 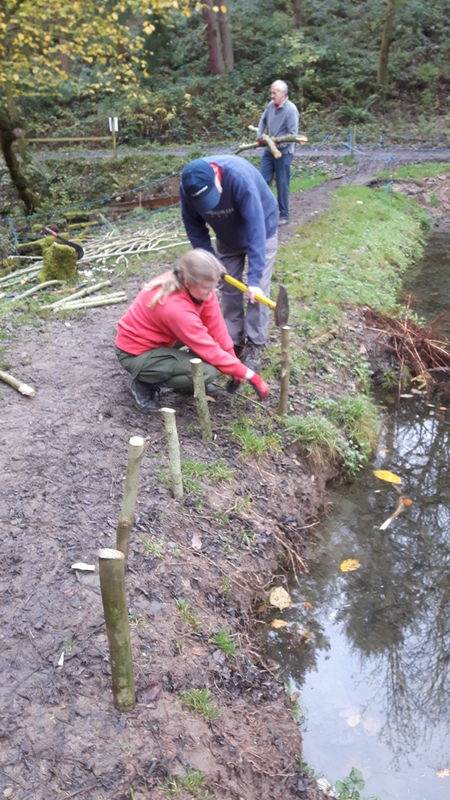 I don’t know when the last survey was undertaken but with the possibility that the Dams in the Fishpool Valley are to be renovated, I guess that the survey was instigated to show whether this protected species is still present in the pools and streams, and how they use the site. 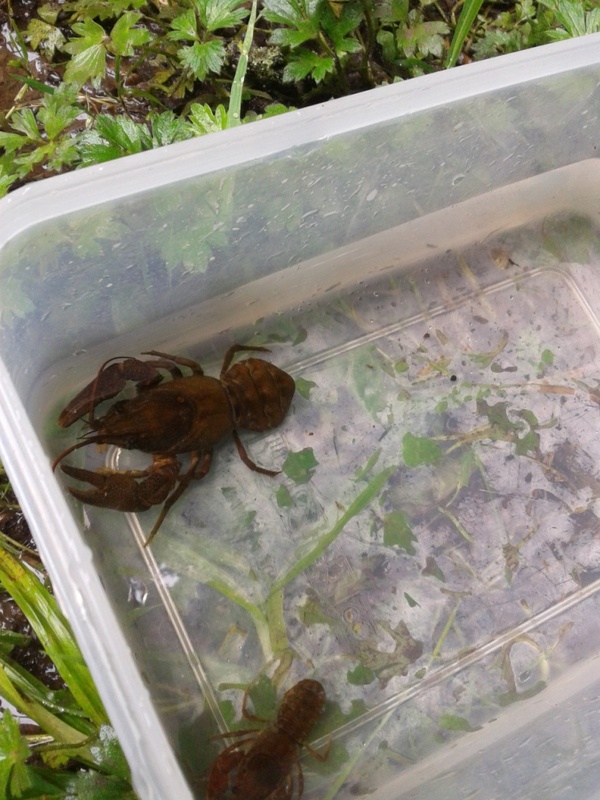 This will then translate into a plan to show how to avoid, reduce or manage any negative effects to our white clawed crayfish, if and when any future work is undertaken. 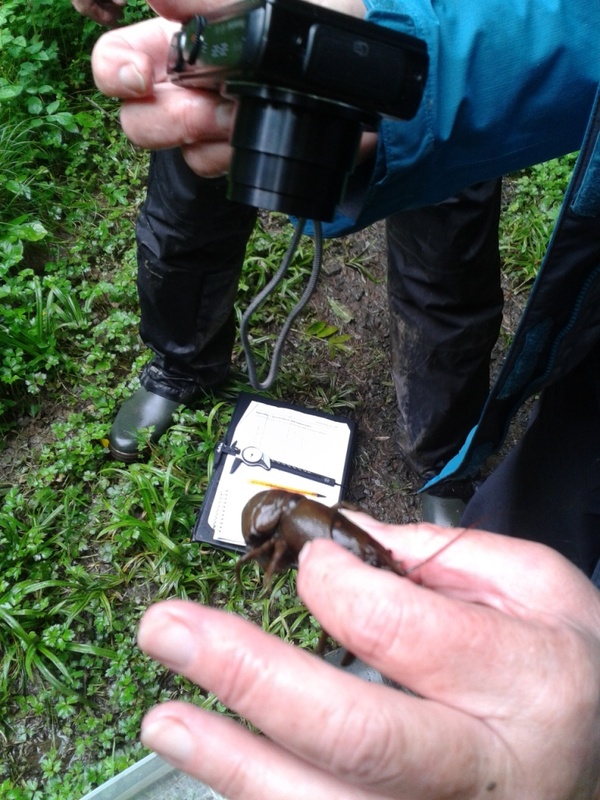 All the crayfish that were caught were measured, note the micrometer. 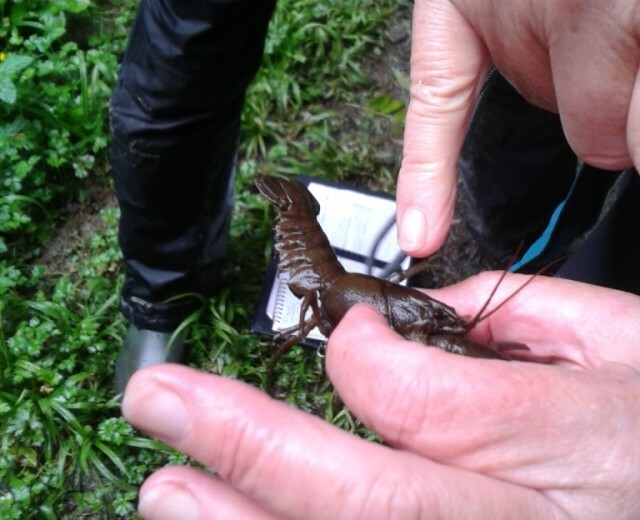 Dr’s Graham & Ann Hill were engaged as the survey team to undertake the Ecological Survey & Monitoring of the presence of crayfish in the pools and streams of the Fishpool Valley. Three of us who are rangers here at croft were fortunate enough to be able to accompany them during the two days they were at Croft. On a fine Monday morning we all set off on a drive along the valley to show the survey team the extent of the water course that rises up from a spring at the top of Lyngham Valley. 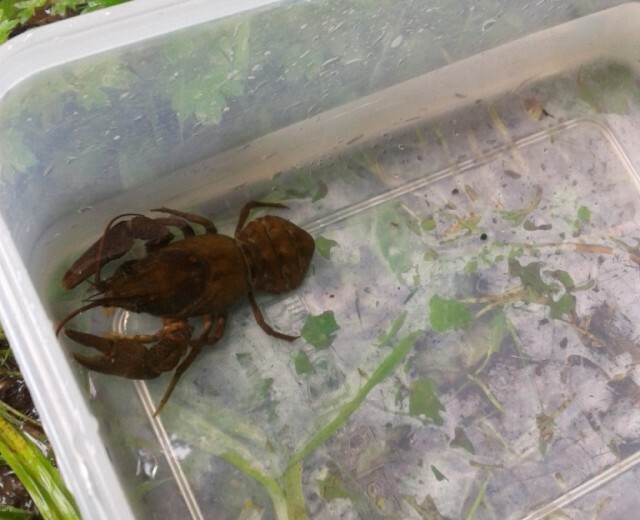 Having determined the most likely extent of the range of the crayfish, we accompanied the monitoring team as they began the first element of the survey. 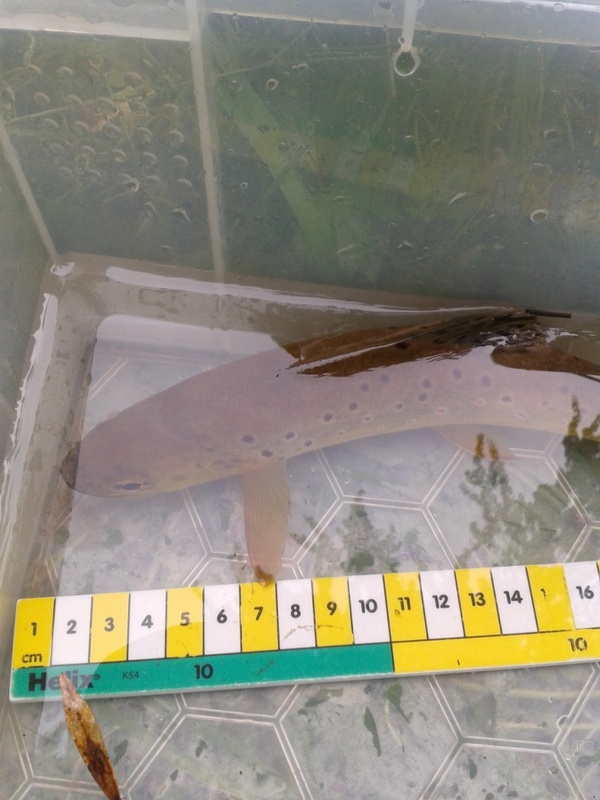 The survey had three elements; a daytime search, a night time search and the laying out of nets in the fishpools. Starting the search in the stream that runs along the eastern edge of Whyberry, we made our way up the valley scrambling over fallen trees, climbing up and over the dams and battling our way through nettles and bramble as we followed the course of the streams that connect each of the fish pools; we eventually ended at the top pool adjacent to the Lime Kiln. 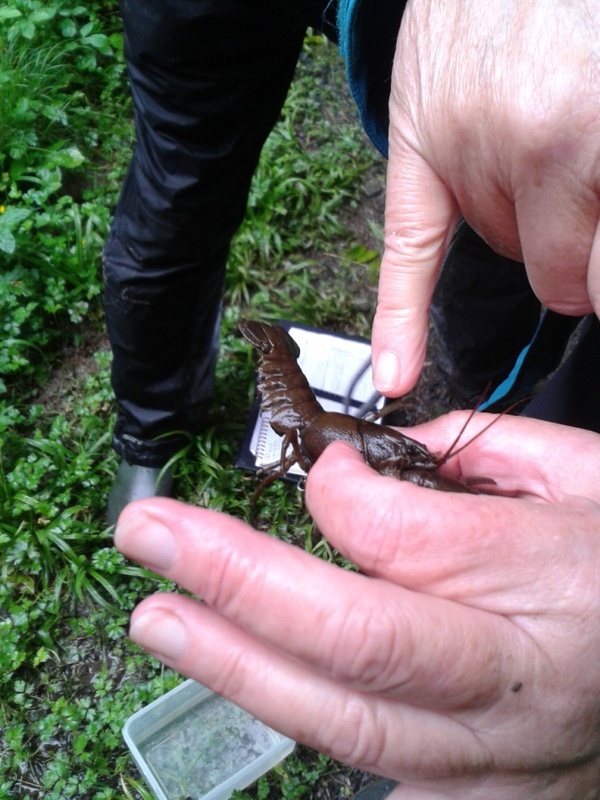 During this first element of the survey we were shown where and how to look for crayfish. By late afternoon I think we, all three, had a very good idea of what were the most likely habitat areas along the stretch of the valley and despite the fact that crayfish are nocturnal, had actually come across several crayfish under stones and hiding in the stream banks in several locations. We met up with Ann & Graham again at 7 pm that same evening to begin the next element of the search. However, before we set off for the night time search we had to set out the catch nets that would be left in place in each of the pools over night. 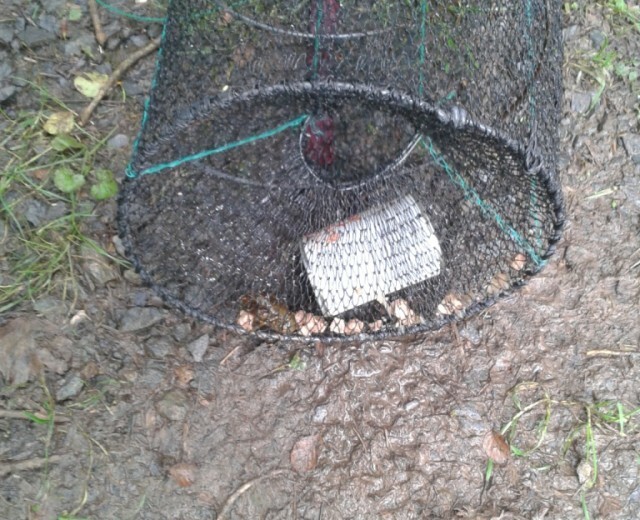 A licence is required that permits the surveying of white-clawed (or Atlantic stream) crayfish (Austropotamobius pallipes) by hand, net or trap. 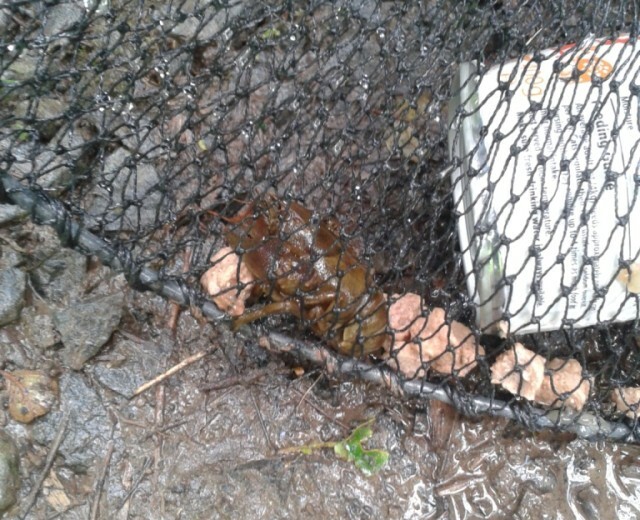 The nets that are used are also strictly controlled. The methodology of the whole survey is also undertaken in a standardised manner that ensures that subsequent surveys produce comparable and consistent evidence. With five catch net secured in each of the six pools, we all returned to our day time start point by which time it was dusk. 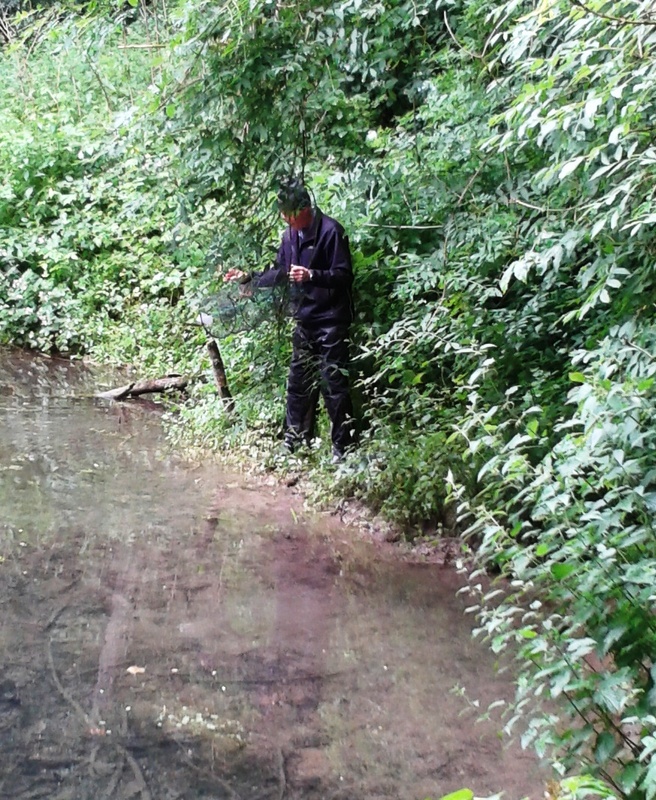 The night time survey is undertaken using a high powered torch and rather than lifting stones and using hand nets as we had done during the day, it was now a case of looking closely for movement and treading carefully as we made our way along the banks of the streams. We followed almost the same route along the length of the valley floor although there was far more stumbling and scrambling than there had been during the daytime. By midnight when we finished, we had recorded more numbers than on the daytime search and notably more adult crayfish. 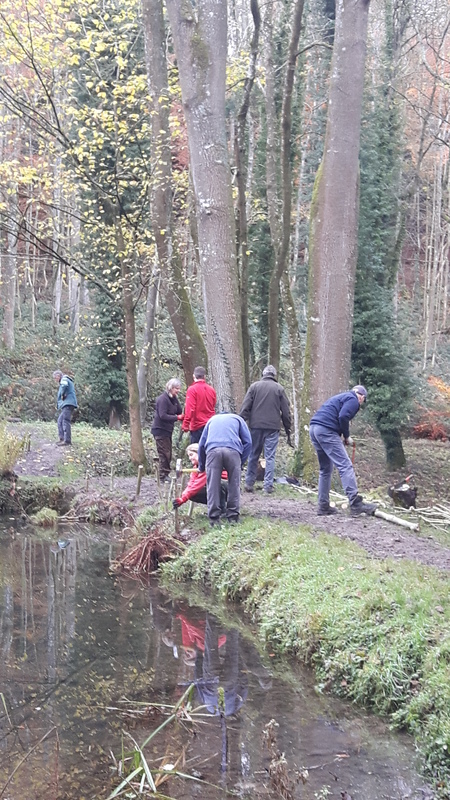 The Tuesday morning was dedicated to recovering the thirty nets that had been left in the fishpools over night. 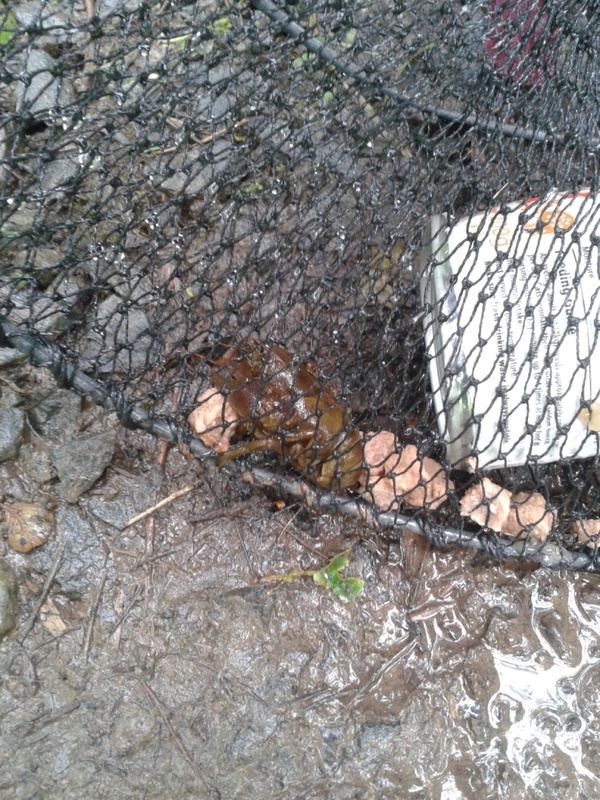 The catch resulted in smaller numbers but revealed that the crayfish inhabit both fishpools and the streams that interconnect them. Each catch is examined to assess gender, size and health. This had been a very rewarding exercise, not least the sounds and views in the Fishpool Valley in the evening; the reflections in the pools as the sun was going down, the evening bird chorus, the fish jumping and the owls hooting their presence. Those claws give quite a nip. 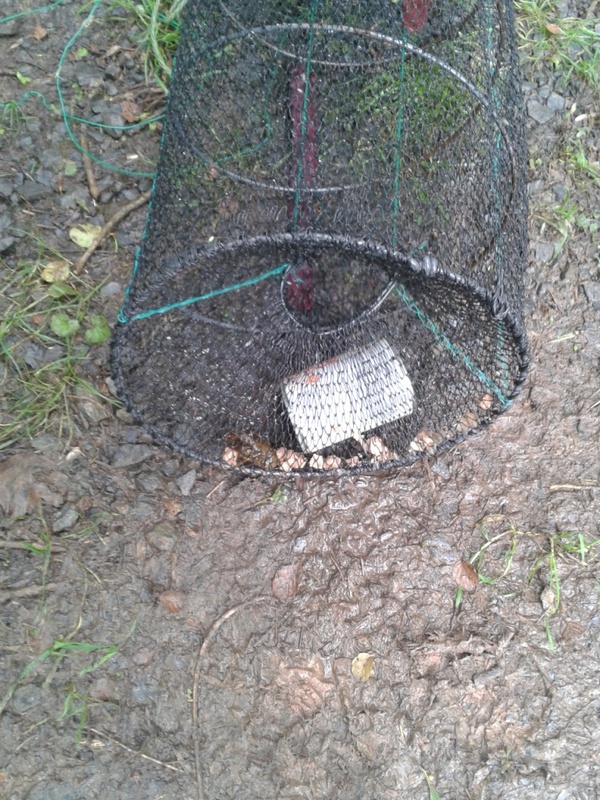 It wasn’t just crayfish we caught in the nets. 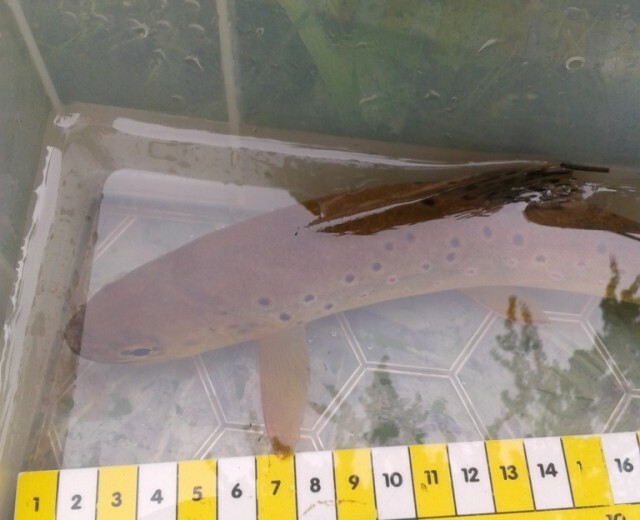 The pools are also home to Scottish Brown Trout. Above all it had been a revealing survey conducted by Graham and Ann Hill whose enthusiasm was infectious and patience and willingness to share their knowledge quite exceptional. We await the publication of their analysis with great interest.